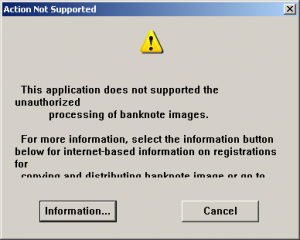 The scanner software recognizes money and refuses to process it, to make it harder for the kids to produce counterfeits. Does anyone out there know since when this functionality is being implemented? Though there have been systems to prevent photocopying (rather than computer connected scanners) of bank notes for a lot longer. There was initially some confusion with people assuming that scanners would not work with bank notes because of the photocopier anti-forgery systems. Interesting find, Chris – thanks! Ich in mal so frei und stell dazu einfach einen Wiki Link ein.